Online applications have been invited for recruitment to the posts of Gramin Dak Sevak | under Telangana Circle,India Post.A total of 127 vacancies have been announced.The last date for submission of application is 09-04-2018 . Other Details of the recruitment can be found below. B. EDUCATIONAL QUALIFICATION:- The candidate should pass 10th standard from approved state boards by the respective State Govt. / Central Govt. The state wise list of approved boards is at Annexure ‘A’. No weightage will be given for possessing any qualification(s) higher than the mandatory educational qualification. The Candidate passed Xth class examination in first attempt will be treated as meritorious against those passed compartmentally. C. COMPUTER KNOWLEDGE:- The candidate should have computer knowledge and will be required to furnish basic computer training certificate for at least 60 days from a recognized Computer Training Institute. Certificates from Central Government/ State Government/ University/ Boards etc., will also be acceptable for this purpose. This requirement of basic computer knowledge certificate shall be relaxable in cases where a candidate has studied computer as a subject in Class X or Class XII or higher educational qualification provided the candidate submits a certificate of Class X or Class XII or higher educational qualification in which he/she has studied computer as a subject. D. RESIDENCE:- The candidate selected for the post of GDS BPM must mandatorily take up his/her residence in the Branch Post Office village within one month after selection but before engagement as Gramin Dak Sevak Branch Postmaster. The candidate shall submit a declaration to this effect in the application. The candidate selected for the post of other than GDS BPM should reside in post village/delivery jurisdiction. E. ADEQUATE MEANS OF LIVELIHOOD:- The candidate applying for the post shall note that he/ she will have adequate means of livelihood to support himself/ herself and his/ her family from other sources so as to have to supplement his/her income. However, this shall not be a pre requisite for candidates for the purpose. Selected candidate shall be required to comply with this condition within 30 days after selection but before engagement. The candidate shall furnish an undertaking in the application itself that he/ she has other sources of income besides the allowances to be paid by the Government for adequate means of livelihood for himself/ herself and his/her family. The candidate after selection as Gramin Dak Sevak shall have to give the undertaking again before engagement. F. FURNISHING OF SECURITY:- The candidate applying for the post shall note that he/she shall furnish security amount of Rs. 25,000/- in the event of his/her engagement for the post of BPM and Rs. 10,000/- for other categories. The security shall be in the form of Fidelity Guarantee bond or National Savings Certificate pledged to the Department of Posts in the name of the President of India. G. ACCOMODATION FOR LOCATING BRANCH POST OFFICE:- The candidate selected for the engagement of BPM shall have to provide centrally located accommodation in the Branch Post Office village within 30 days for use as Post Office premises and the expenditure of the hiring if any needs to be borne by the candidates. H. No person holding an elective office will be considered for engagement to the post. I. The candidate selected as Gramin Dak Sevak shall not engage in any activity with any outside agency which would be detrimental to the business or interest of the Post Office. J. Past experience or service of any kind will not be considered for selection. K. Cycling knowledge is a pre-requisite condition for GDS posts attached with outdoor duties. L. A Gramin Dak Sevak shall be outside the Civil Service of the Union and governed by GDS (Conduct and Engagement) Rules 2011 as amended from time to time. N. How to apply:- Candidate who desires to apply online will have to register himself in the portal through https://indiapsot.gov.in or https://appost.in/gdsonline with the basic details to obtain the Registration Number. 2. However, fee payment is exempted for all Female and SC/ST candidates. They may apply online directly through the provided link in the Website. 3. For applying online candidate should submit the application by providing information of Registration Number (and Fee payment Number once, in case of fee to be paid) to proceed to fill up the subsequent information. Documents once uploaded against one registration number will remain in the server hence for submission of subsequent posts or for other Circles, candidates need not upload any documents further. The candidates need to upload documents in the following format. The appointing authority of each post reserves the right to modify or cancel the notification of a post at any time without assigning any reason. The Telangana Postal Circle, India Post has finally declared Gramin Dak Sevaks Results of its all divisions to fill 645 vacancies. Are you among those who have applied online for the Gramin Dak Sevaks vacancies 2017 under Telangana Circle? Then you all are informed that the Telangana Gramin Dak Sevak (GDS) Result 2017 and Merit List have been declared online at www.appost.in website. 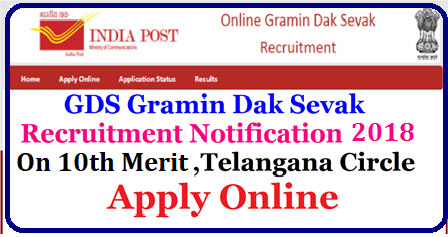 To know whether your name has been shortlisted for Telangana Gramin Dak Sevak Merit List 2017 or not to fill 645 vacancies in various divisions of Telangana Postal Circle, you are advised to check result status online at www.appost.in. Finally! The much awaited Telangana Gramin Dak Sevaks Result 2017 is out now that you may check online along with Merit List of candidates who are supposed to recruit in various divisions of Telangana Postal Circle i.e. Adilabad, Hanamkonda, Mahabubnagar, Nalgonda, Nizamabad, Karimnagar, Khammam, Peddapalli, RMS Z Division, Hyderabad City, Hyderabad Sorting Division, Hyderabad South East, Suryapet, Wanaparthy, Warangal, Medak, Sangareddy , Secunderabad etc. The Telangana Postal Circle has made the selection of candidates for the Gramin Dak Sevaks post on the basis of marks obtained in academic career i.e. in 10th class only. A large numbers of candidates have applied for GDS Posts under Telangana Circle against Advt. No. RE/GDS/2016-17. Now, they all are informed that Telangana Gramin Dak Sevak Result 2017 declared that you may check as per Name wise/ Roll No. wise. The Result of Gramin Dak Sevaks 2017 under Telangana Postal Circle has been uploaded on www.appost.in website with complete details like Category wise Merit List, Name of candidates shortlisted for Division wise GDS Post etc. You are advised to check Telangana Gramin Dak Sevak Results 2017 to know whether your name shortlisted for the GDS post in the respective division for which you have applied or not. Here, you must know the selection process for the Telangana Circle Gramin Dak Sevaks posts. Well! The suitable candidates have been shortlisted for the Gramin Dak Sevaks posts to recruit in Telangana Postal Circle to fill 645 vacancies on the basis of marks obtained in 10th class only. On the basis of 10th class marks sheet, the India Post has made Merit List of candidates as per category wise. After the declaration of Telangana State GDS Result 2017, you all must be eager to know the Telangana GDS Merit List 2017 of candidates as per category wise. Finally! The Merit List of Gramin Dak Sevaks 2017 who are supposed to recruit in various divisions of Telangana Postal Circle are listed below that you may check or download from www.appost.in website. The Telangana Circle Gramin Dak Sevak Merit List 2017 released online that you may check as per Category wise and Name wise. On the basis of marks obtained in 10th class, the India Post has made Telangana Circle GDS Merit List 2017 of candidates who are going to be filled in all divisions of Telangana Circle. Taleganna Post has made it quite distinct about the post allocation in district wise and notified all the candidates that in each district exactly how many vacancies are open. I HAVE FOLLOWING DOUBTS PLEASE HELP ME OUT OF THIS. are now able to apply online? is your registration number accepting ? Here what is certificate number may be it means hall ticket number ? Which circle u applied for?? How to get Registration Number? When i try to apply its not accepting my city, its showing please enter city. help me out. What is OBC Creamy layer certificate? I passed out 10th in 2004. I got caste certificate in MRO Office. Is this eligible to upload while apply for the post. I have registered for my Gramin Dak Sevak post on 05-04-2017. Unfortunately my mobile number was entered incorrectly. Hence, i request you to help me in this matter. My Registration number is R08FDC5648132. I have also mailed the concerned helpdesk in this regard. But there is no response yet. Please if you have any idea about this please call me: 8639669762. I have registered for my Gramin Dak Sevak post on 10-04-2017. Unfortunately BoardD Of passing 10TH class Is Entered maharashtra state board of secundary and higher secondary education with 600 marks. but actual is 650 marks.Hence, i request you to help me in this matter. My Registration number is R67E7E44E34A7. I have also mailed the concerned helpdesk in this regard. But there is no response yet. Please if you have any idea about this please call me: 9604218888 OR EMAIL Me at - shrinivas.gaware001@gmail.com. When will be the results declared sir. Please give a notification. •Make sure the web address http://www.appost.in is correct. I have registered for my Gramin Dak Sevak post on 15.05.2017. Unfortunately my mobile number was entered incorrectly. Hence, i request you to help me in this matter. My Registration number is R3B244DCDD848. I have also mailed the concerned helpdesk in this regard. But there is no response yet. Please if you have any idea about this please call me: 9749808692.
when will be the results?